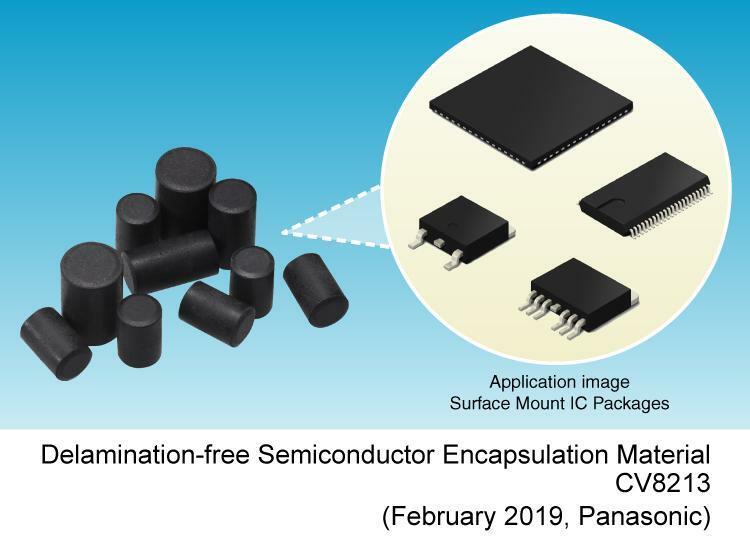 Osaka, Japan - Panasonic Corporation announced the commercialization of a new delamination-free (*1) semiconductor encapsulation material designed for semiconductor packages use in automotive and industrial applications. Full-scale production begins in January 2019. This product improves the reliability and extends the life of semiconductor packages operating in elevated temperature environments. The power semiconductor devices used in automotive and industrial equipment applications are operating at increasing temperatures. This trend is a result of reduced device sizes, higher-current operation, and more modular designs. Semiconductor packages, particularly those used in high-temperature environments, are prone to failures caused by interfacial adhesion loss between the lead frame (*2) and semiconductor encapsulation material. This type of delamination is often the result of differences in linear coefficient of expansion properties between the lead frame and the encapsulation material. To address this problem, Panasonic has commercialized a new delamination-free (*3) semiconductor encapsulation material that employs a combination of unique resin design and reaction control technology. This product achieves the reliability standard AEC-Q100, Q101/Grade 0 (*4) for electronic components used in automotive equipment, improves the long-term heat resistance required for automotive ECUs (Electronic Control Units) and increases the reliability of industrial equipment. *1 Delamination: Interfacial failure between the lead frame and semiconductor encapsulation material in a semiconductor package. *2 Lead frame: A metal substrate for supporting and securing a semiconductor chip and connecting to the wiring on the circuit board. *3 Based on Panasonic's internal evaluation samples. No separation observed between the lead frame and the semiconductor encapsulation material were detected using on measurements made using SAT (Scanning Acoustic Tomography) Equipment. Panasonic does not guarantee that no delaminated parts will be detected under any evaluation conditions. *4 AEC is an abbreviation for the Automotive Electronics Council, a group consisting of auto manufacturers and US electronic component manufacturers. The group promotes worldwide reliability standardization of the electronic components used in automobiles. Q100 applies to integrated circuits, while Q101 applies to the category of discrete semiconductors, and grade 0 indicates an operating temperature range of -40˚C to +150˚C. The delamination-free capability for suppressing separation between the lead frame and the semiconductor encapsulation material imparts semiconductor packages with increased heat resistance and longer operational life. Improved adhesion of the semiconductor encapsulation material to the lead frame. The reduced stress at the lead frame and encapsulation bond line enables the level of reliability required for automobile electronic components. This material also complies with automobile clip-bond packages (*5) requirements, contributing to the improved reliability of these semiconductor packages. The capability to suppress separation between the lead frame and semiconductor encapsulation material provides semiconductor packages using this product increased temperature resistance and longer operational life. Previous semiconductor encapsulation materials experienced a considerable difference in linear coefficient of expansion between the lead frame and semiconductor encapsulation material. In high-temperature environments, this mismatch caused separation (delamination) between the lead frame and semiconductor encapsulation material in the temperature cycling (1000 cycles between -65˚C and +175˚C) required for automotive applications. This issue often required an additional lead frame roughening process to improve adhesion of the semiconductor encapsulation material. The product CV8213, however, has a much lower coefficient of thermal expansion than previous materials thus reducing the stress between the lead frame and the encapsulant. This product was formulated using Panasonic's unique resin design capabilities and reaction control technology, which suppresses delamination even in high-temperature environments like reflow assembly processes and temperature cycle testing, imparting semiconductor packages with increased temperature durability and a longer operating life. The improved adhesion between the semiconductor encapsulation material and lead frame and the reduced stress experienced by the resin enable the package level reliability required for automotive components. This product improves the adhesion between lead frame and semiconductor encapsulation material and reduces the elasticity of the semiconductor encapsulation material by using Panasonic's unique resin design technology to relieve thermally induced stresses, particularly in high-temperature environments. This feature enables semiconductor packages to meet the challenging AEC-Q100, Q101/Grade 0 reliability standard for electronic components in automotive equipment and insures the reliability of semiconductor packages required for automotive applications. This product also meets the specifications for automotive clip-bond type packages, (*5) thereby contributing to improved semiconductor package reliability. Because automotive semiconductor packages are used in elevated temperature environments and carry high currents, the connection process is changing over from conventional wire-bonding to clip-bond connections. A clip-bond package has a large contact area between the semiconductor encapsulation material and the lead frame metal clip. This package design requires strong adhesion between the encapsulation material and clip area of the lead frame. This semiconductor encapsulation material product exhibits both increased temperature resistance and the excellent adhesion strength required for clip-bond packages to be adopted in future automotive applications, thus contributing to enhanced semiconductor package reliability. *5 Clip-bond package: A semiconductor package design comprising a copper clip connected to the semiconductor chip. Replacing the previous structure of using aluminum wire-bonding to connect the semiconductor chip and lead frame. This product will be exhibited at the "SEMICON CHINA 2019" to be held at Shanghai New International Expo Centre on March 20 - 22.